Ian is an award winning magician holding the title of 'Most Entertaining Magical Act' in the Home Counties. 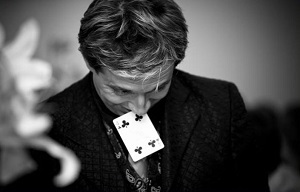 He is a unique performer as he combines clever close-up magic with mentalism or psychological illusion. Ian is a full-time performer at weddings, corporate events and private parties. He also performs a stand up show which consists entirely of mentalism. Ian is also a member of the prestigious Magic Circle and is based in Buckinghamshire, however he travels widely to perform. 'Thanks for the brilliant 'wandering magic' and mentalist show. Everyone was talking about you after you had left (and the next day when many of them descended on us for breakfast!). Damion Bentley's unique mix of close up magic & mentalism, create an atmosphere of mystery & wonder, leaving all that come into contact with him both stimulated, and spellbound. Bentley is flexible & able to entertain intimate groups, Parlour/Banquet settings, or mix & move within busy environments, clubs, restaurants & social/corporate functions. Parties, weddings, Charity work & Carnivals. If you need entertainment from a performer that is flexible, unique & committed to bringing the Magic, the Mystery and the memorable impact that you require for your events & functions, Damion Bentley is the choice to make. Have Simon J act as an ambassador for your next event, bringing your guests closer together and entertaining them thoroughly with his unique close up miracles, which act as the perfect ice breaker and are sure to amaze everyone. Simon is highly personable, friendly and always gives 100% ensuring your guests leave with fantastic memories of your event. Wayne is not just another magician, he's a true entertainer!! His unique and sophisticated approach to the art of close up magic, combining sleight-of-hand, misdirection and psychology creates an amazing and exhilarating experience that his audience never forget. Darren's warm and friendly personality shines through when performing, making him a welcome addition to your occasion. Darren has been well received by a great variety of audiences...from his helping to launch a Harry Potter book at Canterbury with his mix-and-mingle magic, to entertaining the troops of our Armed Forces at Colchester with both close-up illusions and comedy cabaret. 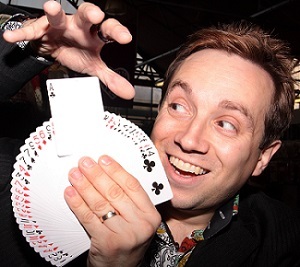 Chris Richards is Milton Keynes’ elite professional entertainer and close up magician. The founder or MK:Magic - the winner of the 2009 Business Awards Entertainment category -as seen on the 2010 Britain's Got Talent & shortlisted for the 2011 Wedding Industry Awards. Chris comes highly recommended and is not only highly involved with premier companies throughout Milton Keynes, such as Mercedes, AUDI, MK Council and the MK Dons Hilton Double Tree, but also performs at hundreds of weddings each year. Chris has performed for and is the recommended supplier for many Milton Keynes bars, clubs and high end establishments, and is never far away from the eye of the excitement. He has been entertaining for over 15 years and has an endless wealth of knowledge in not only close up magic, but a variety of performance types from hypnosis to acting. Chris has a firm relationship in his local area of Milton Keynes, but also performs across the country. He regularly hosts shows in Milton Keynes and Buckinghamshire venues and can also be hired for events outside of the UK. Whatever and wherever the event, you can be assured that entertainment provided by Chris Richards is of superior quality. My name is Josh, I'm a young a close up magician. My main area of expertise is card magic and flourishing, I also perform some coin magic. I also have a selection of magic tricks in my repertoire that is suitable for children's parties. I live in Northampton, but am usually in Milton Keynes. I am willing to travel. One of the UK’s most exciting children's entertainers. Amazing magic and puppet shows, superb balloon modelling, fun filled workshops, heart stopping mini disco’s, lots of games and prizes and much, much more. Simon guarantees 100% customer satisfaction and will turn your next event into an entertainment success!! Equity insured and CRB checked for complete peace of mind. Where does he perform? : Nationally, Bucks, Beds, Berks, Oxfordshire, London, Northamptonshire, Herts.